From coast to coast, busy DIY-selfers are making handmade items to sell over the holidays. Whether it’s their side hustle or full-time gig, there’s no shortage of love that goes into making these products. With so many great items to choose from, there’s no need to shop for holiday gifts anywhere else other than right here at home! Support your local movers and shakers this holiday season, by purchasing fun and unique gifts your friends and family will adore. We’ve rounded up some stellar Canadian-made stocking stuffers to get you started. Who doesn’t love chocolate – especially when the packaging looks as beautiful as it tastes! Alicja Confections’ postcard chocolate bars come in tons of fabulous flavours like strawberry, potato chips and even ramen. Best of all, you can put a stamp on the box, address it to your special someone, and deliver it through snail mail. These sweet scented soy candles are perfect to stuff in the toe of your stocking. Not to mention, they smell amazing too. Blackett & Co. candles are made with all-natural soy and essentials oils for a clean, natural burn. Sadie and June’s hand-embroidered maps are a unique personalized gift you can give to anyone. The makers hand-stitch hearts around provinces, countries and even hometowns to create a special keepsake your friends will love. This bar of soap is not your average lump of coal. It features activated charcoal and gold mica to create a unique mining-inspired bar that smells great and gets the job done. Each bar is packaged with custom designed paper that makes it even more special. Go back to your 90s kid days with these adorable temporary tattoos from Wild Canary Studio. Whether you’re gifting them to a child or someone who’s young at heart, these tats are a step above the rest and are an easy item to add to a stocking. The holidays can be stressful. Give the gift of a wintery wonderland scented bath from Call Me Sugar Cosmetics. 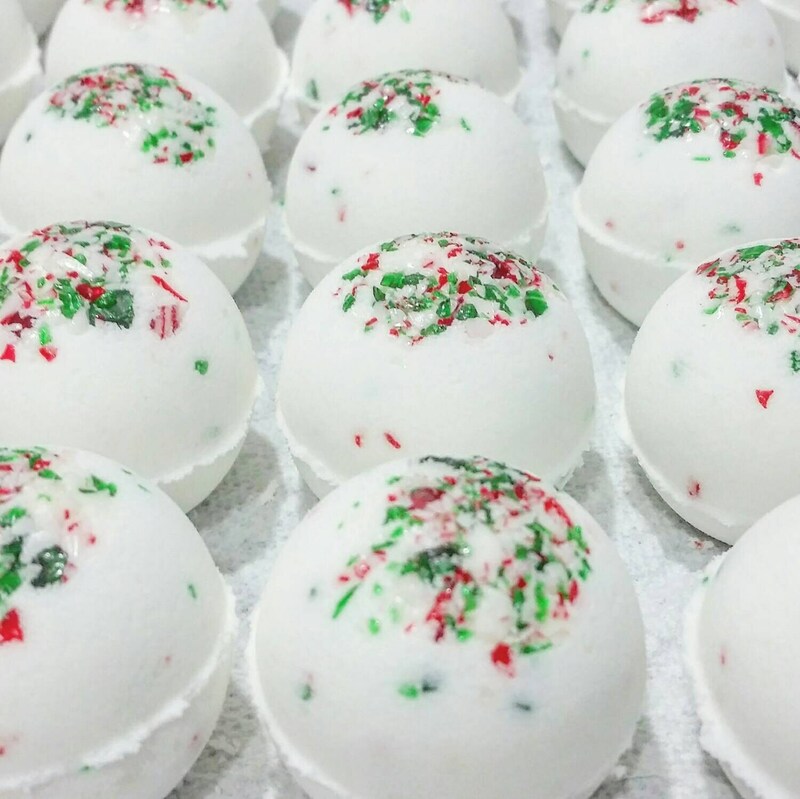 Their candy cane bath bombs smell divine and give off a light peppermint scent that is proven to relieve stress, headaches and aches and pains — win-win! Winter gets cold, but your hands don’t have to. Keep your friend’s and family’s fingers warm with a pair of hand-knit mittens from Oban Lodge. They’re cozy and practical and will likely be used almost every day this winter! This winter, heat things with some delicious homemade hot sauce. We’re not talking about your average spicy mix. Sriracha Revolver makes a mean beet and tequila blend that will blow your pants off. Every gal enjoys a good pair of earrings — especially when they’re laced with gold. Whether they’re watching the ball drop on New Year’s Eve, or wearing them with their favourite tee, these studs from Birch Jewellery are sure to impress to BFFs. Make your friend a happy camper with this super adorable enamel pin from Oh My Inspired. Whether they are a collector of pins or love a good road trip, this camper pin is the perfect addition to add to their stocking. A ring dish is a great gift for your DIY friend who’s always losing her wedding ring or favourite bracelet while doing crafts. Instead of putting jewellery on a ledge to get lost, a catch-call dish like this one from Marbella Dish is perfect to place in common areas so your friend will never lose their prized possessions again. Every girl has things to be kept. From secrets, to bobby pins — a cosmetic pouch is always useful to stash in your purse, gym bag or desk and helps you stay organized. You can even go the extra mile and fill it with breath mints, hair ties and your favourite lip balm before tucking it away in your bestie’s stocking. Is your hubby growing a handsome lumberjack beard? Gift him a woodsy scented beard oil like this one from Lonewoods. It smells like sandalwood, cedar and oranges and will help to condition and maintain his facial hair. If you’re buying Canadian-made, you might as well gift a Canadian icon – poutine! These super cute ornaments from Creations by Catherine are sewn by hand and make us want to binge on curds and gravy-covered fries right now! Embroidery is all the rage this year, which makes this zodiac hoop from Fixed Stitches on trend, and perfect to gift your best friend. They’ll appreciate the personal touch and remember you every time they look at their star sign. Who doesn’t like sipping their morning coffee out of an awesome looking mug? This black and white camping mug from What The Fox Hat is perfect to cozy up with a book or bring to the office. Pair it with your favourite hot cocoa, and you’ve got yourself the perfect stocking stuffer. Does your friend have a stressful job or just need something to help them chill out? Popping an essential oil blend like this roller ball from Muse Aromatherapy is a low key way to help them take a deep breath and relax. This mix features lavender and cedar which also helps relieve anxiety — an all too familiar feeling during this time of year. These adorable banners can jazz up any dull space and offer a bit of inspiration wherever they go. Not only are they great in spaces like a gym locker or office, but they would also work well in a child’s room. Go ahead and spread good vibes! A Christmas ornament is a great little gift to tuck away in your loved one’s stocking. This adorable wintery fox ornament from Art of Melodious is the perfect theme to your holiday stocking stuffers. We hope you enjoyed these Canadian-made gift ideas. Now go forth and shop, eh?